There are only days left to the very first ‘Gathering at Uisneach’ at the Uisneach Inn Bar and Restaurant, Ireland’s most central venue at the foot of the Hill of Uisneach. The two day boutique music festival will feature music from some of the biggest names in Irish music, all gathered together in the centre of the country. Our headline acts are all making waves internationally: The Original Rude Boys are currently on a world tour with The Script and in the past few months have sold out The Olympia and practically every venue they have played; Rubber Bandits are still making huge waves in the UK following their triumphant Channel 4 TV show; The Riptide Movement are playing all of Europe’s biggest festivals this summer (including Glastonbury & Bennicassim) AND touring the UK with the Rolling Stones; Ryan Sheridan has toured the globe in the past year to full houses and ecstatic reviews, and is set to do so again this year; whilst KÍLA are celebrating 25 years on the go with some huge European events. The Gathering at Uisneach is being brought to you by the people behind Festival of the Fires, in association with IPB, The Gathering and Westmeath County Council. The Gathering at Uisneach will be a boutique two-day music event, held in the shadow of the Hill of Uisneach at a special new outdoor festival site adjacent to the Uisneach Inn Bar and Restaurant. 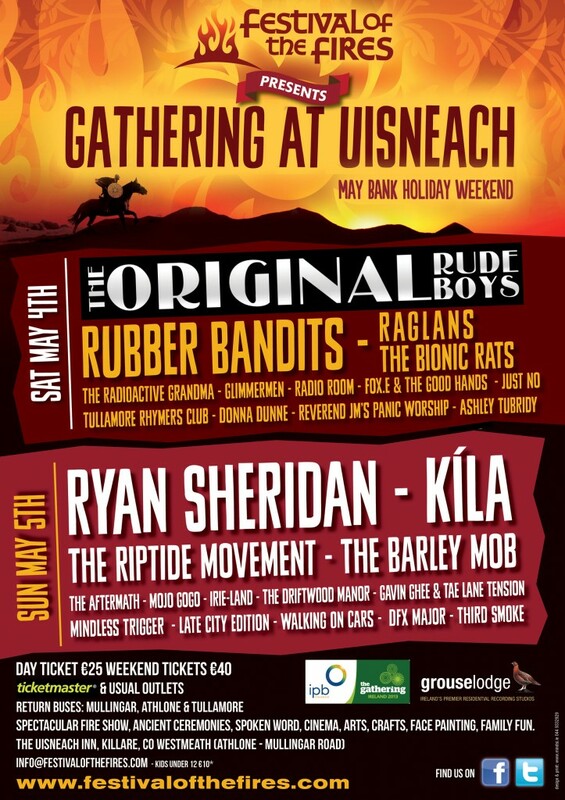 On Saturday May 4th, The Original Rude Boys, The Riptide Movement and the Rubber Bandits (making their first ever appearance in Westmeath) will perform! On Sunday, May 5th, Ryan Sheridan and Kila are among the performers. Many more acts are playing at the outdoor and indoor stages, and the event will feature heritage talks, re-enactments, genealogy stands, local food & drink, fire show and much more. Early bird tickets are on sale now, priced €40 for the weekend and €25 per day. They are available online and from all Ticketmaster outlets. Tickets with camping are also available, priced €50 for the weekend. For those wishing to camp just one night, a limited no of places will be available on a first come, first served basis. Details of these tickets and campervan accommodation to follow. Follow us on TWITTER and like us on FACEBOOK for all the latest news! This entry was posted on Tuesday, March 19th, 2013 at 3:21 pm	and is filed under Art and artists, Blog, Festival of the Fires Music, Fire Ceremonies and Parade, Get involved!, Uncategorized. You can follow any responses to this entry through the RSS 2.0 feed. Both comments and pings are currently closed.